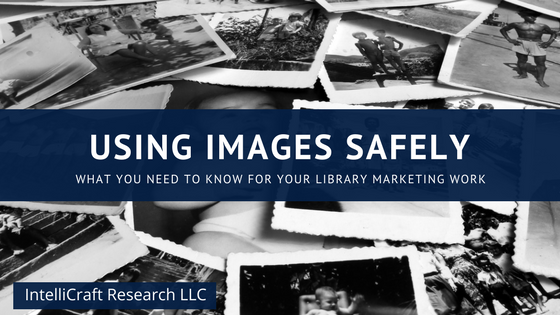 I was asked by a librarian recently if I could share some tips on using images in their library’s marketing materials and how they could help staff and fellow librarians to stay on the safe side when finding and using images from online sources. 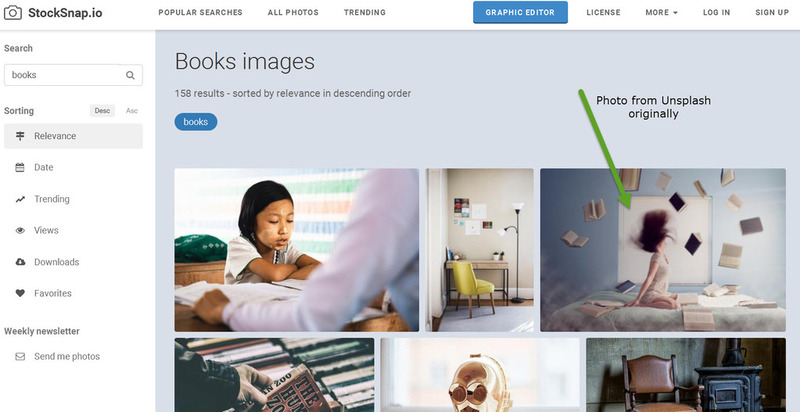 And while I’ve written articles on finding good, high-quality images and I link to many excellent photo sources on my Recommended Marketing Tools page – I agree that properly using images you’ve found online can be tricky. Another reason I care about this topic – I’ve been a serious amateur photographer since I was a kid. I have literally lost count of how many cameras I’ve owned, many of which are still in my house somewhere. From my Instamatic with flash cubes, Polaroids, to110 film, my first 35mm point-n-shoot, disposables, to the glorious 70s era Pentax SLR I learned to shoot and develop black&white film for, to the expanding collection of DSLRs, action cams, and a new mirrorless camera I now own. I geek on photos. And I wouldn’t want mine being used willy-nilly or ‘borrowed’. I created a video several years ago that addresses this topic and includes some of the same tips I’ll give here – but this post is more current, with fresher resources, links to my fave sites for finding ‘safe’ images, and hopefully offers more expertise. Remember, just because an image or creation you see online doesn’t have a copyright symbol © doesn’t mean it isn’t copyrighted – EVERYTHING is automatically protected by copyright as soon as you create it. Check the terms of any social platform if they have their own rules on re-sharing of images. Know what’s ok for each. Know what your intentions are for an image you will use in marketing – think of everywhere it COULD eventually appear – and make sure you’re covered for all those possibilities. Get the right licenses. Don’t assume “Fair Use” applies or is in play, especially because you’re a library. It might ok to share an image that the creator first shared on social media – if they’re signaling that sharing was their intention. Plus what a creator thinks is ok may be different than what law says is ok. It’s NOT ok to borrow, steal it, print it on flyer or a t-shirt. If someone, even someone famous, didn’t intend for a pic to go public, it’s not ok for you to keep sharing it online. There’s some melding of multiple grey areas of copyright, intellectual property, fair use, what’s commercial use, etc in the use of images for various business purposes (and that includes for nonprofits like libraries). An infographic flowchart on decisions to use images was included by the library colleague with this request – and while attractive, it’s still confusing – and the Copyright Librarian, Nancy Sims addressed its problems several years ago. When in doubt, get explicit permission for exactly the use you have in mind from the original copyright owner. When still in doubt, don’t use that photo. 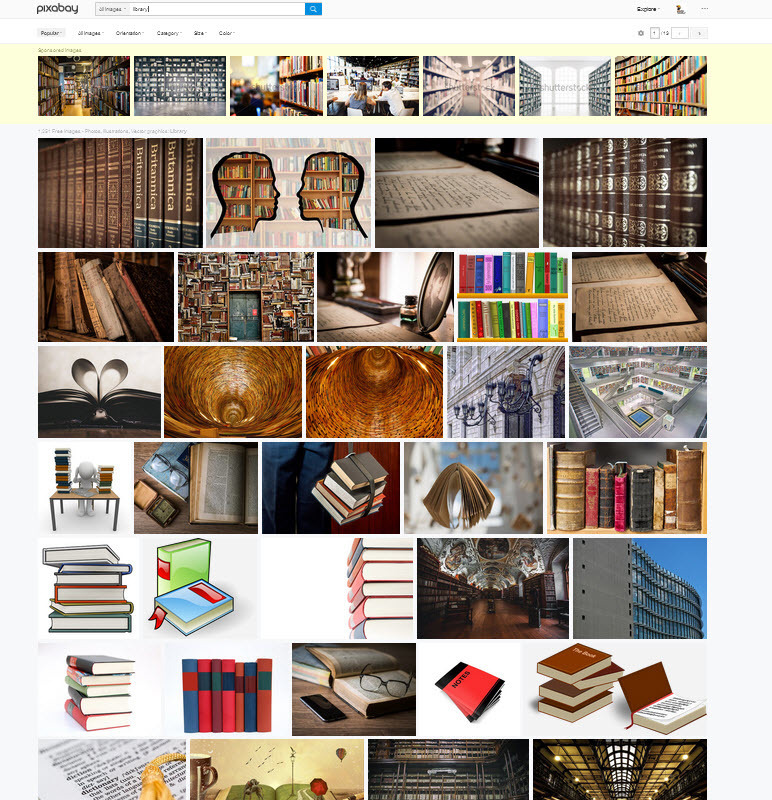 First Things First – Don’t Use What You Find in a Google Images Search! I know, I know … it’s easy and even we info pros use Google a lot. And it says it has images for reuse … But this is just too dicey -and too likely to see search results return images that have scraped from who-knows-what-corner-of-the-internet. At least dig up info on the provenance of an image you really like. Double-check its ownership. If you’re going to insist on searching Google Images, at the very least use the button for “tools” and the filter for “Usage rights” and filter by “labeled for reuse.” HOWEVER, know that these tags or labels on if a photo can be reused can often be incorrect. They may not be from the original creator or copyright owner. Maybe someone grabbed a photo from some other site, posted it on their own, and said ‘sure, “reuse with modifications” is ok!’ but they don’t actually own the copyright. Just because it’s on Google doesn’t make it fair game – we librarians and info pros know better, right?! What are Stock Images or Stock Photos? Royalty Free – the most common type; you are paying for near unlimited use of an image, IF you follow its license rules. You pay a fee one time and can use a photo many times. This is a non-exclusive right – meaning anyone else shopping at the same stock site can purchase the same image and use it however they like. Tend to be relatively cheap. Rights Managed – less common; there are more restrictions on the scope and timing of use. Rights are often ‘time, and geographically limited, specific and per-use,’ which grants more exclusivity. Fees depend on where you use an image, how often, for what purposes, etc. Tend to be pricier. Royalty Free does NOT mean “free”, as in no cost. It means you do not have to pay ongoing royalties to the rights owner for every use of the image, or for the number of times it is seen, nor do you have to secure the model release, etc. BUT you must pay for the license, the right to use the image (including multiple times). Costs for the license are often based on image resolution size, related to file size. What size you need to purchase a license for depends on what you’re using the image for – in a blog post vs. high resolution in a video vs. print quality, etc. NOTE – most royalty free image licenses are for NON-COMMERCIAL use. Which would cover most blog posts, presentations, use only internally. Just because a library or a nonprofit do not traditionally ‘sell’ anything, doesn’t mean they couldn’t run afoul of COMMERCIAL vs. NON-COMMERCIAL use. This is where you may need to consult an expert in intellectual property, trademark, copyright law. Editorial Use = any image marked as such can only be used for news or purely informational purposes. This is mostly because they feature other entities that have their own copyright, trademark, and intellectual property issues – such as celebrities, public figures, commercial products, logos, etc. 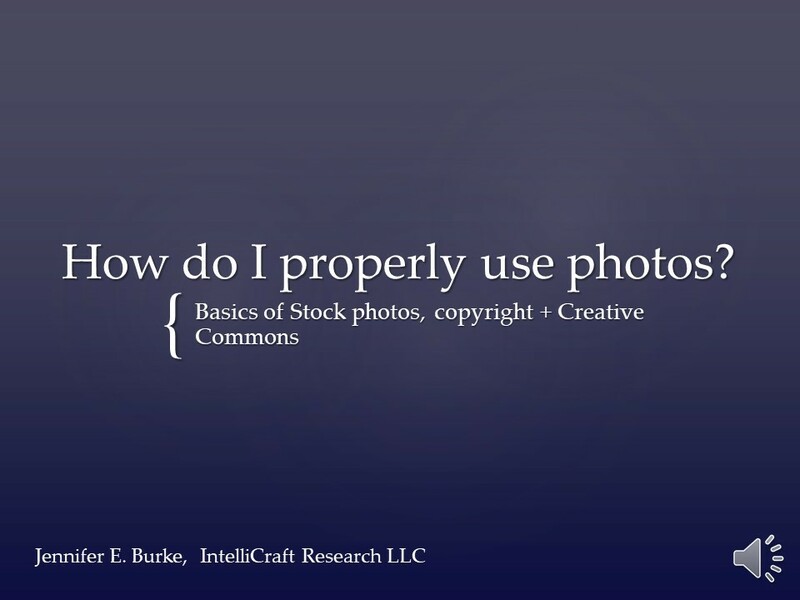 Why Should You Care About Royalty-Free Stock? The safest images you can use in your marketing materials are ones that you yourself have taken and thus explicitly have permission to use. Getting a good quality digital camera for your library can be a wise investment (one reason to go DSLR – most know also shoot HD video, can take an external mic, and the flexibility of changing lens makes them perfect for all occasions). But camera gear is another post for later! Baring that (because we’re not all photographers, nor can we take all the images we may need), purchasing a license to use a photo is the next safest way to go. Buying the rights through a well-established stock site, that’s done all the legal work for you, can save you hassles in the long run. Yes, it costs money and I realize you have limited budgets – but if you want a really safe route, this is it. What you should NOT do – use images you find in a Google Image search! I’m very leery of images found with the filter “labeled for noncommercial reuse”, or the other reuse filters. [run a search -> TOOLS -> Filter by (drop down menu) -> ] Some of these images, under “labeled for reuse” might be permissible to use with correct attribution, or if under Creative Commons licenses. But some could have been ‘borrowed’ or lifted from other sites improperly, and used on a site like Wikipedia – lending one to think they’re safe. And they may not be. Another big caveat and to bust a misconception on image attribution …. Merely giving credit or attribution or a citation to an image you found online does NOT count as permission to safely use that image. Attribution also has nothing to do with “fair use” – they aren’t related. And “fair use” is a pretty big grey area with a whole lot still up to the lawyers and courts. Look, if you re-post an image on Instagram, or share from Facebook, then by all means you better cite the original source and link directly to them. However …. Unless you specifically ASKED for permission to use a photo – it’s not a legit use. Don’t post it on your website, don’t use it in a flyer … Take it down. Attribution as permission only counts if you acquired an image specifically from a site that offers images in exchange for certain forms of attribution. If you see an image you like on some other site, you can’t ‘borrow’ it, use it on your site and just link back to the original. Well, that’s better than nothing … sort of. Nope, just don’t do that! Explicitly ask for permission from the photo’s copyright owner. Always do that unless you are using certain image sites, which I’ll mention below. Like this post? Want to see more on time-saving marketing tips, cool tools, and resources like finding and using images in your marketing materials? Then be sure you’re on the invite list for the next FREE monthly Marketing Tool Talk Webinar. Boost your marketing skills in less than 60 minutes a month. * I’ve had accounts or purchased images from Fotolia, iStock, 123RF, and Deposit Photos. I don’t personally recommend Getty Images because of some predatory, overly legalistic, and other wise unsavory behavior on their part. This is by no means an exhaustive list of every stock site out there, just the largest and most reputable. 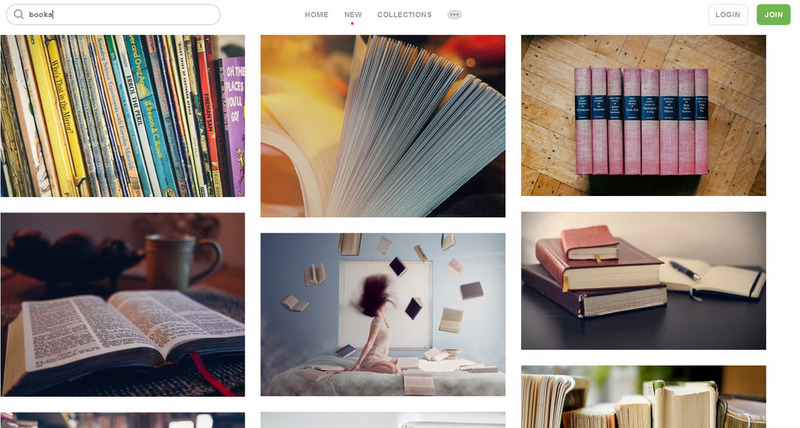 ** Another note – I have a Canva for Work account – and that includes access to a LOT of their stock photos, for free. [the image in the header/featured image for this post came as a free photo in a search while using Canva] You do get more photos vs. the 100% free Canva account. Plus, Canva still offers very cheap vectors, illustrations, and photos to purchase and use in your designs. Ironically – many of the photos they charge $1 for come from some of the CC0 sites seen below, others from other stock photo sites. But at least you know if you purchase an image as part of your design, you are in the clear. Always check licenses and terms in case they change! Several of these sites have email address opt-ins (naturally) and by registering for a free account or signing up for their emails, they will send you free photos, vector images, sound, and/or video clips each month. FreeDigitalPhotos – http://www.freedigitalphotos.net/ you can use the small files for free, but MUST publish a credit link for the creator, in the format noted, exactly as specified on the site. If you can’t, or don’t want to, publish the credit link, you can purchase image rights/license. PhotoPin – http://photopin.com/ free photos for bloggers, online creative types, with similar rules on required attributions or credit links. 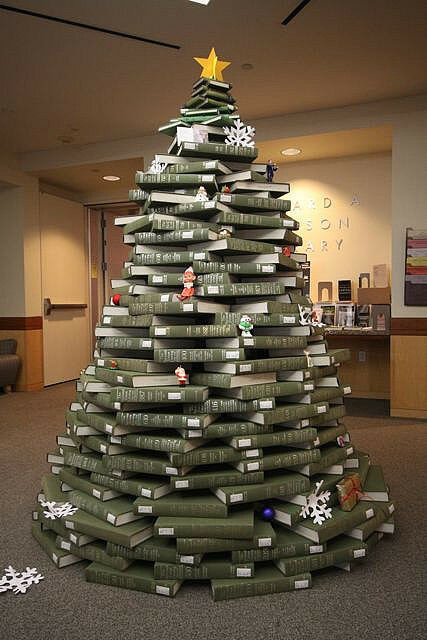 “Natl Union Catalog Christmas Tree” by S Calhoun. Licenses under CC BY-SA3.0 via Wikimedia Commons. If you want to be on the right side of attribution, use the “Attribution – BY” (CC BY) or the “Attribution-NonCommercial” (CC BY-NC) licenses and follow these styles. If you modify an image, you must note that in your attribution. If you want to be super-duper safe, you CAN give attributions even for CC0. How Else Can I Find Images to Use Safely In Marketing? Creative Commons Zero – a photographer, illustrator, author – any creator who has given over their works to the Public Domain and waived their rights to control the work. CC0 items may be modified, used, or reused however you’d like. I also list photo source sites as well as image editing tools on my Recommended Marketing Tools page. My top two, the ones pinned to my browser and that I probably use at least every other day: Pixabay (inc. clip art, illustrations, vectors, video clips) and Unsplash (gorgeous work! a site started by and for serious photographers). Pixabay has a much better search interface and tagging than Unsplash, so I use it more. You CAN give attributions if you’d like, you can also send donations (‘cups of coffee’) to image creators, and if you create a free account you can skip the Captcha process for each download. Pexels – a curated collection of photos, some are original to Pexels, but many may be pulled from other CC0 collections. I already said I’m neither a lawyer nor a copyright expert, so do consult other sources if you want to be even safer after you’ve read this primer of sorts. And if you have resources I should add, email or tweet me and let me know!